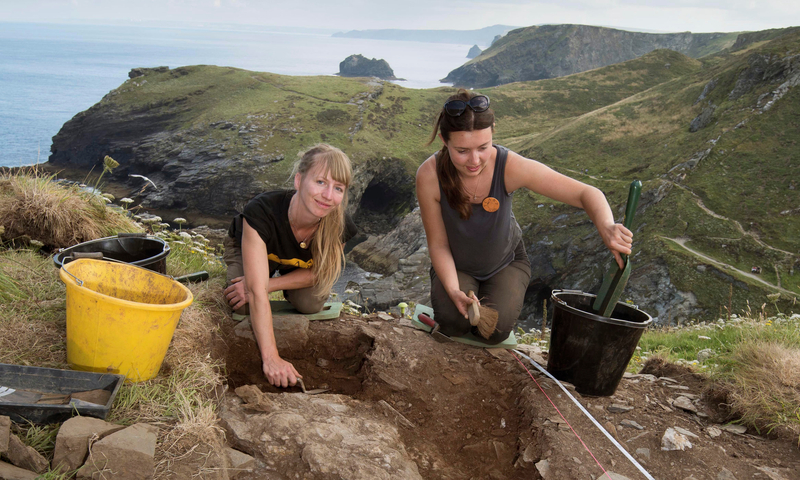 A team from the Cornwall Archaeological Unit (CAU) have discovered a stone engraved with an extremely rare example of writing from the 7th century at Tintagel Castle in Cornwall. 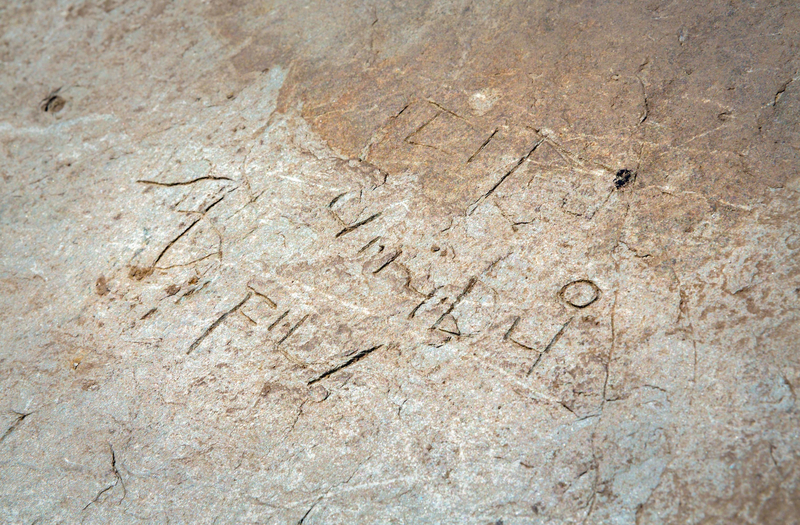 It’s not a formal inscription; it was carved by someone doodling or practicing on a window ledge at the castle. The slate ledge was found under the ruins of the 13th century castle built by Richard, Earl of Cornwall, brother of King Henry III, in an excavation that is part of five-year archaeological survey and excavation commissioned by English Heritage. Digs began in 2016, and archaeologists quickly found the remains of massive stone walls. Fragments of pottery and glass imported from Merovingian France, what is today western Turkey, North Africa, the Aegean are evidence of a thriving trade in luxury products between Tintagel and the Mediterranean from the 5th century until the decline and abandonment of the site in the 7th century. When the stone was discovered, its importance was immediately evident. It wasn’t until the stone was cleaned that archaeologists saw the wording and realized they had found something of major significance. Researchers will continue to study the slate. X-ray fluorescence (XRF) analysis has not found the remains of any polychrome paint, but archaeologists are hoping high resolution scanning will shed more light on the scribe, whether he was left or right-handed, and on the inscription itself, like what tool was used to carve it. The stone has gone on display at Tintagel Castle as of this Saturday, June 16th. This entry was posted on Saturday, June 16th, 2018 at 11:15 PM	and is filed under Ancient. You can follow any responses to this entry through the RSS 2.0 feed. You can skip to the end and leave a response. Pinging is currently not allowed. A shopping list? – What I read, is “ICITO”, “Z”, “FILI”, and in the middle thereof, what might be in Greek, Latin or Arab “UTHERPENDRAGON”, “ARTHUR” or “BUDIC”. Where does it say “VIRI DUO”? ..OK –with a little fantasy– the “Arthur” might be indeed “VIRI BUO”. Moreover, the “Z” might also be an “A”, possibly indeed with a “V” -or- in lower case a “B”, and could it be that the photographer was “practicing” as well? Are parts missing”? Why exactly is there no additional picture in plan view (i.e. with lighting from aside)? “(d)icito viri duo A fil i” ? Carolingian minuscule, for example, was created partly -and I dare say, seemingly for a reason- under the patronage of the Emperor Charlemagne so that the alphabet could be easily recognized by the literate from one region to another. What does it matter? Arthur was from Kelso. By the way, calamity! The Glasgow School of Art has had another fire and this one may have destroyed everything beyond any hopes of salvage. It reminds me what a tiny part of ancient life is represented by archaeological finds. Most stuff, good or bad, perished long ago. Yeah, it’s indeed all volatile, Dearie. And you may have a point with ‘Kelso’. Is there information on Iron Age and Early Medieval cattle herding and driving available, e.g. to and fro the pastures? In the bottom left hand corner on that photo, there might be what could be “bɣdic”. The term could be interpreted as ‘cattle judge’ (βοῦς) or the one in charge of the trail. Maybe, two locals from Tintagel joined the trail to Glasgow with their cattle, who knows? As I always say: Never underestimate a cattle herder’s “level of literacy and awareness of contemporary writing styles, associated with illuminated manuscripts”! What a view at that dig. Just… watch your step!